"Our Most Reader Requested Brands"
Rolling papers should be a key item in all smoke shops. Although papers are included with many tobaccos, anyone who takes their hand rolled tobacco enjoyment seriously will eventually upgrade to better papers than those typically bundled with tobacco. Rolling papers are eye candy and help dress up any shop. And then the fun begins. It is our observation that most seasoned roll your own enthusiasts prefer a fairly neutral paper. They want something that does not taste like "paper" or anything other than the tobacco wrapped inside. For them, the perfect combinations of materials used for creating the paper includes rice, hemp, and flax, sometimes even with just a bit of tree based cellulose as a binder. I still find it hard to beat some of the old standards we've been writing about for years. Brands like Zig-Zags of almost any stripe but, most particularly, the Orange packaged 1¼s. These (Zig-Zag rolling papers in general), more than any other (except for cheapies like TOP & Bugler), are the most widely found brand of papers especially in most general merchandise environments. HBI's Zen, Elements, RAW and their high end DLX again MUST be in every appropriate venue. And distributors worth their salt should carry them as well for retailers, who also can get them direct!y from each of these companies! However, beginning with our original premise of many years ago regarding rolling papers (the fact that what has often been most attractive and compelling to myself and other consumers has been the incredible artwork found on the packaging) we continue to look at rolling papers. As stated in our cover synopsis as we started the new update, brands that have been around a very long time (centuries) and that display the same kind of artistic timelessness, as one used to find on fruit crate labels of the past, are hard to resist. There is no brand out there that has more historic and artistic panache than Bambu. Putting aside the fact that they are also incredibly well made and great smoking papers, the icons of this brand are stunning. They evoke a time past when smoking was social, it was more moderate (despite what the film industry of the time displayed); a time of Humphrey Bogart and the Maltese Falcon where his character Sam Spade hand rolled every cigarette, a time when most everyone rolled their own smokes, and fake tobacco substitutes like recon and other garbage did not exist. Though much older as a brand Bambu's current artwork harkens back to a time when guitarist Django Reinhardt and his most vital violinist, Stephane Grappelli were thrilling European and American audiences of the 30s, 40s and 50s with their unique brand of "Gypsy Jazz". The principal logo on the Bambu brand (or at least my favorite) is shown above left. It is quite evocative of what that "Hot Jazz Club" era must have "felt" like. I listened to the recorded music a lot but unfortunately was not around to hear it live. If you click on the image (above left) itself or here you'll be taken to the Bambu site where you can see a whole lot more of the beautiful art work this brand has produced over the centuries. You can return here by simply closing the new page that comes up. Bambu, as did others, for awhile join the flavored paper crowd, probably feeling it necessary to compete with a few offerings, but they have so much quality, image, and history on their side (like ZigZag who has their own History Page for history buffs) that the gee-whiz factor of fruity flavored sweet tasting papers always seemed to me to be a distraction at best. They along with most other manufacturers have left that market (see below for more detail). 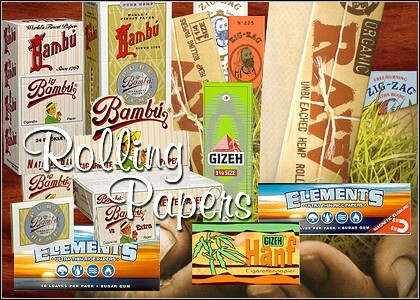 Bambu has a number of extraordinary papers from their standard rice and flax to some pristine hemp offerings. Many sizes all with great eye-catching packaging. They roll and smoke great and impart no unwanted flavor to the tobacco. And they say something about the customer - Taste! & Pure Class! A person who shops around to find the best and patronizes those places that carry the best. They were my absolute favorites in the 60s and 70s and remain top among my many favorites now. As we stated in the cover intro for this new issue, a tobacco shop that does not carry Bambu papers is, in our opinion, operating under false pretenses. Simple as that! And our readers agree. The most requested brands our readers tell us they are looking for are made by HBI, ZigZag, If you are retailer and don't carry all of them, you are CRAZY! The flavored paper market, thanks once again to the silly over-reach of the FDA, is on the ropes but not out completely. Currently while many manufacturers have stopped making them, they can be made and sold for non-tobacco uses. This is but a part of the rolling paper story and though it seems to be an ongoing struggle with government and anti-smoking propagandists, at this time we feel that nothing more we can say will have any effect on the outcome. And myself particularly, finding no use for flavored papers, preferring instead the natural flavor of whatever I'm smoking, saying more here on the flavor issue would be simply a waste of electrons, except of course to re-emphasize that the Government or any of its agencies have no right in telling any adult what kind of paper to use, unless it poses some direct threat - like I suspect with fire safe cigarette paper for instance. Still some herbal blends do benefit from those flavors and the fact that the FDA has proclaimed that flavored papers attract underage smokers just reinforces how much out of touch our government and its agencies are with people, science, and reality and how much "in touch" they are with the special interests of big cigarette companies and the pharmaceutical industry lobbyists. The FDA preliminary regulations are not final but are currently being observed. We will discuss this issue in the future after further resolutions are adopted or rejected. Just imagine (it won't be hard) when See's Candy Chocolate Cremes will have to kept behind the counter and out of sight of kids. Now before we get into some dramatically NEW papers from HBI (their newest Organic Raw brand and others revisited like Gizeh's Hanf (Hemp) classics), there are some other papers that are more traditional that we've known about for a long time but have not emphasized as they are often hard to find. The first brand name is Pure Hemp. These are, as the name implies, pure hemp papers. They are quite beautiful, clean, pure, and completely neutral with a touch of the warm overtones that hemp supplies to the hand-rolled smoking experience. They are also pretty sheer which make for a paper that is more transparent than the traditional rice or flax papers most RYO folks are used to. This sheer transparency carries over to the smoking experience as well, with almost no taste whatsoever transferred to the tobacco. HBI distributes these in the US (not many brands they don't), but in Canada another company, Natural Emphasis, handles them. They are available at most smoke shops and if they are not at yours, we strongly recommend you ask for them. One of the nicest hemp papers available anywhere in the world and, as you can see, the package design is really classy as well. The sticks we make from these papers are not only quite beautiful, but they are very easy to use with handrollers. In fact, their neutrality of taste and ease of use makes them ideal for our testing of initial blends of tobacco. Some hemps are thicker and thus easier to roll but have more impact on the tobacco. Some are even more sheer. We've covered a lot of hemps over the years. These we find to be just right for tobacco testing and for the increasingly fewer times I get out of the office and into the backwoods where I tend to roll all of my smokes. While I could carry an injector in a backpack and even tubes I suppose, I really do like to roll nice pure sticks of tobacco when the feeling strikes. I always use a handroller - my hand rolling skills are way too lacking and inconsistent to enjoy any sort of simple or quick enjoyment on the trail, and the more consistent the stick, the better it burns and the more accurate the tobacco flavor. I like a 3/8 inch stick by the way. This size is just right for flavor and mildness using 79 mm papers like the Pure Hemp. They also come in 70mm and King Size (nearly 100mm). As a side note, while these kinds of papers are among my very favorite for such adventureson the other hand I never did like sweetly flavored papers like any of the sweet/flavored ones in the woods mainly because the bears really do! - and I tend not to bond well with bears. No doubt one might get the idea that HBI is involved with nearly every paper in the US. One must remember that HBI not only manufacturers their own lines, but is a distributor also so, the fact is, if they don't make it, they likely still carry it. Now a new paper that HBI did come up with is called simply RAW. This is perhaps the most unusual paper to come along in a very long time. The name really says it all but for those who may not get it, these papers are as natural as a paper can be. They are unbleached, brown and incredibly sheer to the point of near transparency as you can see from the graphic below. Even though they are sheer to the extreme, they are also easy to roll (again with a roller for me). You can see in the stick above that the tobacco shows right through and were this paper a lighter color you could see each tobacco strand. (Note how the Sharpie pen logo shows through this paper). When you have a paper this sheer, there is no paper taste - none! And being that they are not bleached as most white papers must be to be white, there is not the slightest hint of chlorine. Now most people don't notice the tiny amount of processing/whitening chlorine residue in most good papers but it is there and once you smoke one of these you may be able to tell the difference. I sure could. (I can't stand chlorine in water and use a water purifier on my taps for drinking and cooking - so I could taste the difference, depending of course on the quality of the paper). Anyway these new designs are special, once again showing that innovation is still alive and well, especially so at HBI. Since they sent me the first box, they have changed the font for the packaging. The old script was more edgy, kind of a distressed font look. The new font is more readable and looks less oriental. I guess that mattered to them. 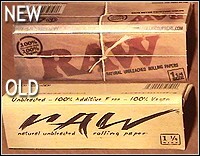 Anyway, the RAW brand papers you will see in your store should look like the graphic labeled NEW at left. Really interesting papers. We're not sure if any of the original design got out so we'll show you both at left. Whichever you see, the paper inside may be the most unusual paper you've ever tried. RAW! 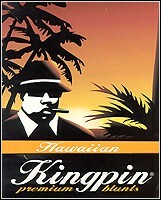 There's one last paper brand from HBI we should look at before it's Blunt-Time. 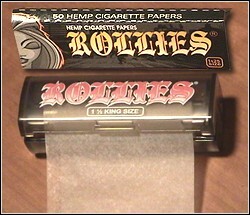 This is their Rollies brand of hemp papers. Of course, they come in a typical interleaved pack 1&1/4 wide, 79 mm in length. These are nice papers. While there may appear to be some redundancy among HBI papers as they have so many brands, the fact is each one is a little different. This is especially the case with Rollies as they not only come in standard forms, but they also (like the RS Rolls we reviewed years ago) come in a ten foot roll of gummed papers. These are nearly double wide (they say 1&1/2s but seem wider) but the real difference is the plastic container they come in. It not only looks really cool but, more importantly, protects the paper roll inside to a greater degree than a cardboard outer. Even more satisfying with this plastic design is the fact that the cutter (shown at left magnified) is sharp plastic and cuts very straight and cleanly. This was one of the most frequent complaints concerning the RS Rolls product, that the paper would tear unevenly (I think HBI has the RS brand as well now - certainly would be no surprise). The cardboard cutter was just too easily bent and worn down after a few uses. Regardless, the Rollies are a superior product, not only 10 ft of gummed wide paper, but in a container that travels better than any other rolling paper I've ever seen, and works perfectly every time. It just goes to show you, there is always room for improvement. From what I considered a bit of a gimmick to a really useful system. The pure hemp papers inside are quite good, fairly sheer and yet strong, one of the real advantages of hemp (in addition to their warm neutral flavor). We take a closer look at a better view of this unique packaging at left, so you can see just how well this container is constructed. Now if your going to carry a roll of papers, the idea is to be able to use all 10 ft (about forty 79 mm leaves worth) of the paper without mishap or waste. Of course you can use your own judgement as to how much paper you pull out, mostly determined by what sized roller you are using, but having a nice clean cut to work with makes an huge difference. And the plastic case exhibits much more in the way of moisture protection, not only from real water like rain, but more commonly from perspiration that papers are subjected to when carried in pockets. Even a slight amount of this perspiration can ruin a paper, especially the gummed edge. Now don't throw these in the river and expect to use them again, but they are incredibly water resistant. This strategy is incredibly more forgiving, and is one that I actually WILL use. Once again, HBI has built a better mousetrap and I think the reluctant acceptance of rolls of paper, as being less than useful for most traditional tobacco rolling enthusiasts will be changed to one of wider use. We don't yet know the price point but I suspect it will be in line with what one pays for a similar amount of interleaved papers. This product really does deserve some sort of award for ingenuity and high quality execution. Now, as promised we'll take a rather brief look at some new blunt wraps. I have to tell you, I've used only a few blunts in my whole life. While this particular wrap style is incredibly popular, I prefer tubes and then standard rolling papers followed by normal sized tobacco wraps, like the Golden Wraps, for smoking tobacco. That's just me but to be truthful, I do have problems with non-gummed papers not to mention non-gummed blunts. I'm not even quite sure how some of them work so well for so many. Since they have no gum, without a lot of slobber I can't get them to stick together very well. Actually, if you get them quite wet (with water) beforehand, roll your stick and then use a hair dryer to dry it, they really do stick together and thus make an effective cigarillo-like finished product. I'm sure there must be easier ways, but they escape me. These HBI offerings come bundled (in this case) with a plastic clear little straw that keeps the Kingpin blunt rolled up until ready for use. Further, each blunt is packaged in a convenient sealed plastic tube that keeps the blunt fresh until ready for use. It's the part that transcends from ready for use to rolling with them that I have trouble with. Obviously, a lot of folks do not have this problem - as I said, they are incredibly popular. HBI has focused on these products quite a bit in the last year or so, and have two brands which are really quite aromatic and tasty. 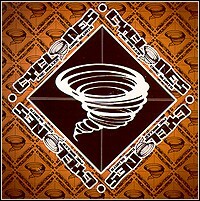 The brands are Kingpin (a name a bit on the edgy side) and Cyclones which are not an open wrap but rather a cone already formed with a tamping stick to pack the tobacco in with. I can't tell much difference in the homogenized, tobacco-impregnated paper between the two except for, obviously, a lot of different flavors. I suggest you go to the Zensmoke site (www.zensmoke.com) to see all the flavors (we simply can't keep up with all the new flavors) but the graphic here (at above right and at left) basically shows you what you get. Note the plastic straw sticking out of the Kingpin blunt wrap above. It's there to preserve the "roll" of the paper to address the issue of the brittleness of these wraps if they do dry out. Already being rolled makes them less prone to break during filling and final rolling. Some sheets we will see in the near future will come flat and it is imperative that these be kept very moist to allow them the flexibility needed for a reliable roll. They need the elasticity analogous to that of a true tobacco leaf when being rolled, say into a cigar wrapper. 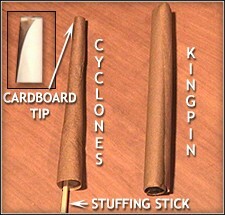 Blunts we have looked at in the past have been so dry on occasion that they crumbled when rolling was attempted. 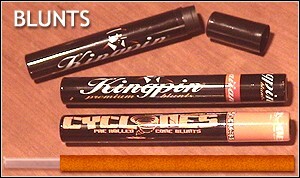 The Kingpin and Cyclones are well protected by the plastic case they come in and the Kingpin (since it needs rolling) also has a cellophane wrapper to aid in moisture retention. Still it is probably a very good idea to moisten all blunt wraps before any manipulation of them. HBI is justifiably proud of their new line of blunts. There have been quite a few other brands we have seen and some we have reviewed over the last couple of years. Benefiting from those who have gone before, as to what works and what doesn't, HBI's new offering are the best packaged, most thoughtful design yet. These items have only recently been accepted into the mainstream of traditional smoke shops. For a while, the two major tobacco trade Shows, NATO (National Association of Tobacco Outlets) and RTDA (Retail Tobacco Dealers Association) would not allow blunt makers (whose only product was blunts) to exhibit in these venues. That has changed to some degree but there are still concerns that these products are used primarily for things other than tobacco. We've seen first hand that this is not the case, though any rolling paper can be used for things other than tobacco. So can any pipe. In concluding this section, let me just say that because of the enormous variety, design, and sheer numbers of rolling paper designs, we would be completely presumptuous to recommend any specific paper. Rolling papers are a matter of taste almost to the degree that is tobacco. Most people buy what they can find. Too many outlets sell limited brands and varieties. These retail stores are really missing a great, eye catching opportunity to bring in new customers and increase their bottom line and propagate and increased interest in diversity. I would recommend all of the papers mentioned on this current page as well as most all we have looked at in the past. Rolling papers are a relatively (compared to tobacco) higher profit product for retailers and even those who are completely convinced thay MYO is their cup of tea, occasionally will use as an occasional treat, rolling papers for stronger, more aperitif-like tobaccos such as strong halfzwares. Papers also make a very convenient way to taste the essence of tobaccos during your first experience with them. While good tubes do not lessen the taste of good tobaccos, there is something much more intimate, using rolling papers, in the relationship between tobacco and the enthusiast. Try a variety of papers even if you are a tube user. You will find they are a refreshing change for the occasional "special" smoke. And they can't be beat for portability and for retailers - profitability. Though we have a worldwide readership (some 100 countries are represented in e-mails) we get a relative small number of international samples. We do get some and, in fact, have helped bring a number of such items to the US market after seeing them first here for review. While we hear from retailers frequently worldwide, there are only a few retailers who actually send us products they are excited about. However, one such exception is a man named Johnnie from the UK. He has a shop and an online tobacco and accessory business and always seems to be on top of the current trends regarding products across the Big Pond. 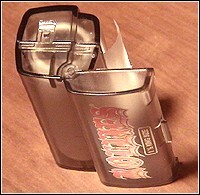 His company, Roll-Ups ( www.roll-ups.co.uk ) operates in an environment in Britain that is even more regulated than here in the US. They don't have the MSA over there, but simply tax the hell out of everything. Johnnie, from time to time, sends us interesting brands we have not seen on this side, brands that are popular in Europe and Britain (not the same thing in case you didn't know). He does ship certain non-tobacco items to the US market and provides some really unique product lines, ideally suited to the collector in us all, as well as functional items that have not made their way to the US market. Visit his site and get a taste of some of what we are missing in the US and, conversely, what they in the UK are missing from us. This truly is a global market and, even with pretty Draconian regulations regarding free enterprise when it comes to tobacco itself, the accessories market is fairly wide open and should be explored. We have long contended that rolling papers often sell based on the exterior design of the packaging as much as for what is inside. Years ago, when one could find a "head" shop on every corner, the design of paper covers was an art form in and of itself, much like fruit crate labels. Designs like these above, while not quite as edgy as some of the older designs, have a lot of flair to them and should occupy a place in the history of this product. Enjoy the art of Rolling Papers. Art is a reflection of life and there are many mirrors available.